WOW! What an awesome collection you’ve got. Her work was so precise. Thanks for the show. I’m looking forward to more. These are beautiful, even more precious that you know who did them. 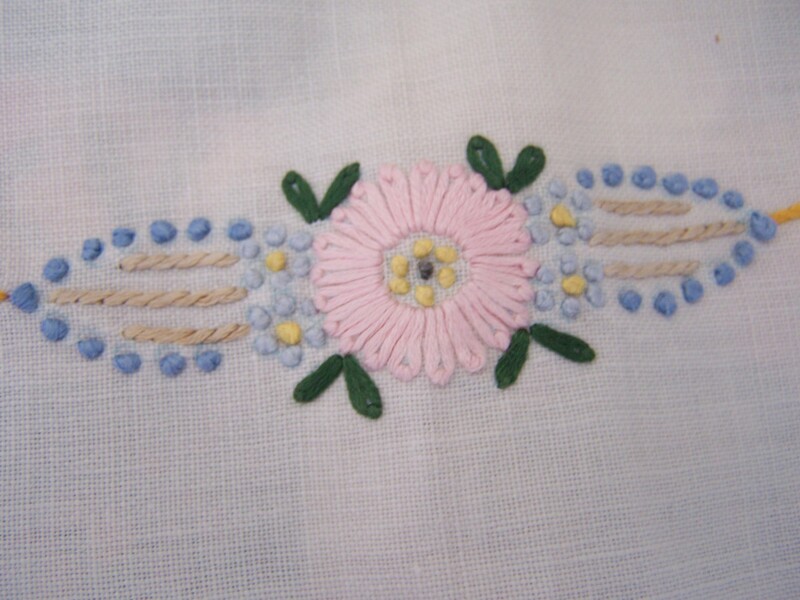 I have pieces that others have parted with because they were of no importance to them, yet, you and I both know the time they took to accomplish the neat stitches. What lovely goodies you inherited! 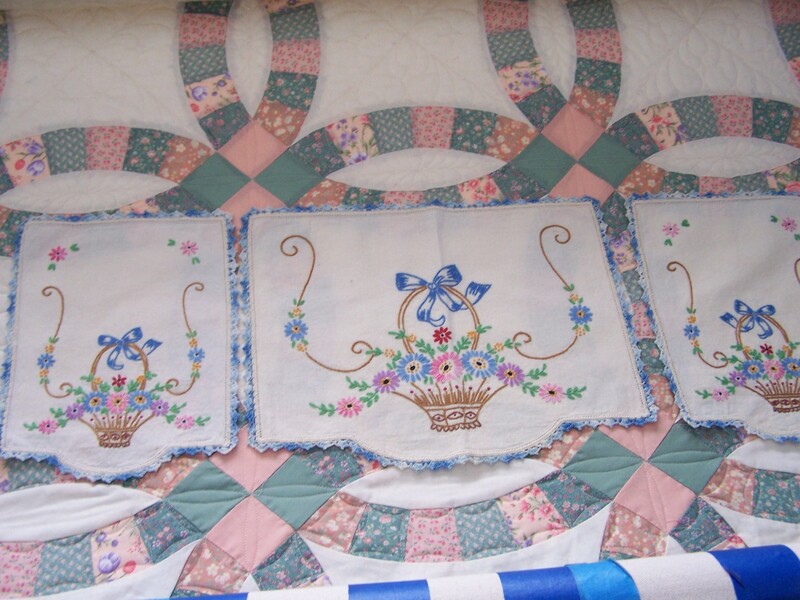 They look so nice sitting on top of that quilt too. How pretty! I’m looking forward to seeing all of the pieces. I understand the tears. 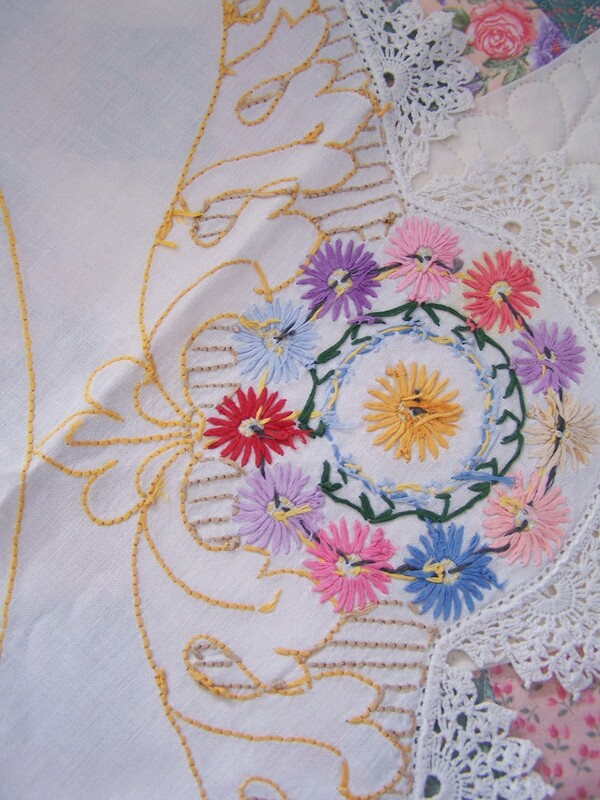 These handworked pieces create such a connection down through the years, even with women we never knew. Something to keep in mind as work our own magic. On the 3 piece set… I have seen very old dressing tables that looked somewhat like a shelf between 2 tall small chests of drawers with a large mirror attached behind the shelf. (Not a good description, but you get the idea. )I don’t know the proper name for this piece of furniture. They were quite lovely and popular. The three piece set might have been used on the tops of the 2 chests with the wider piece on the center shelf/table. It’s a thought. A treasure indeed!! These are amazingly beautiful!! I hope you have a place to display them so you can enjoy them. 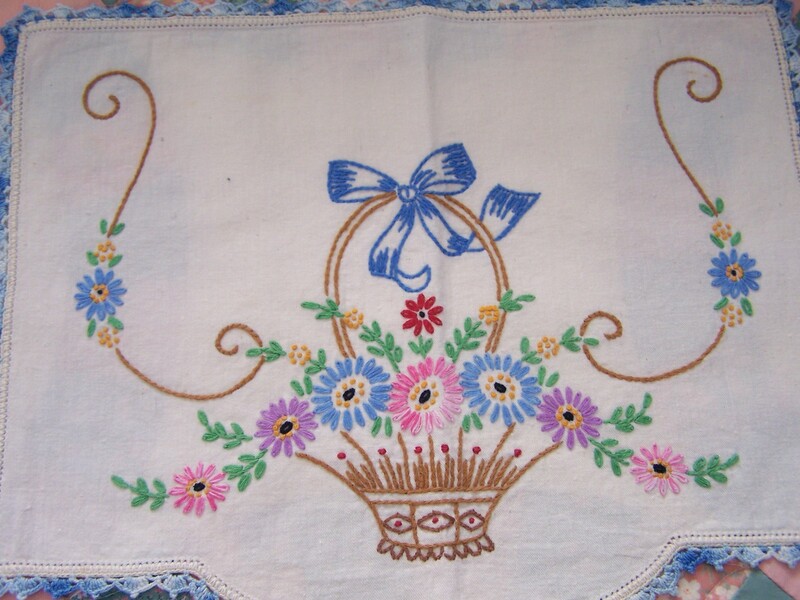 I have one piece of embroidery my grandmother did as a young woman (a bluework tablecloth), and I have a few pieces of my mothers also ( a few crewel embroidery pieces and some needlepoints). I cherish them. Those are fabulous treasures! 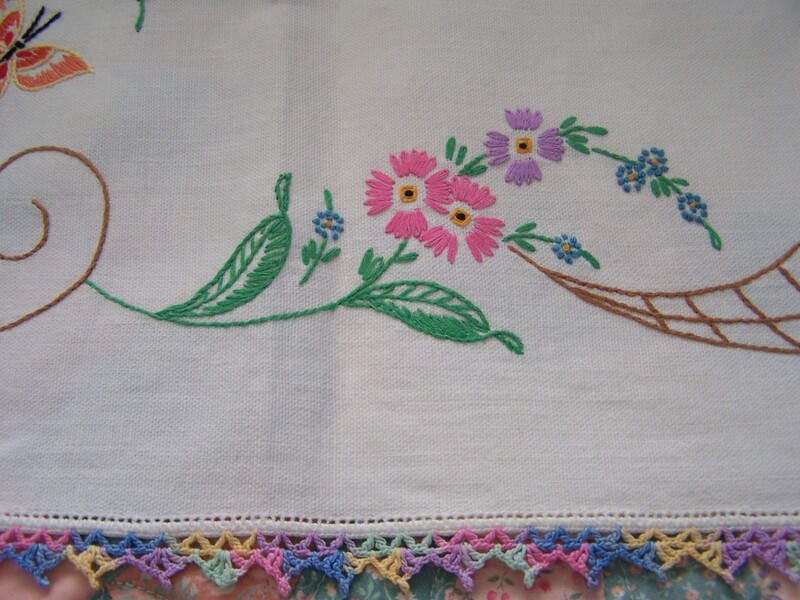 I have some of my Grandmother’s embroideries like those. Those last three might also be antimacassars, but I think Linda’s theory is best. 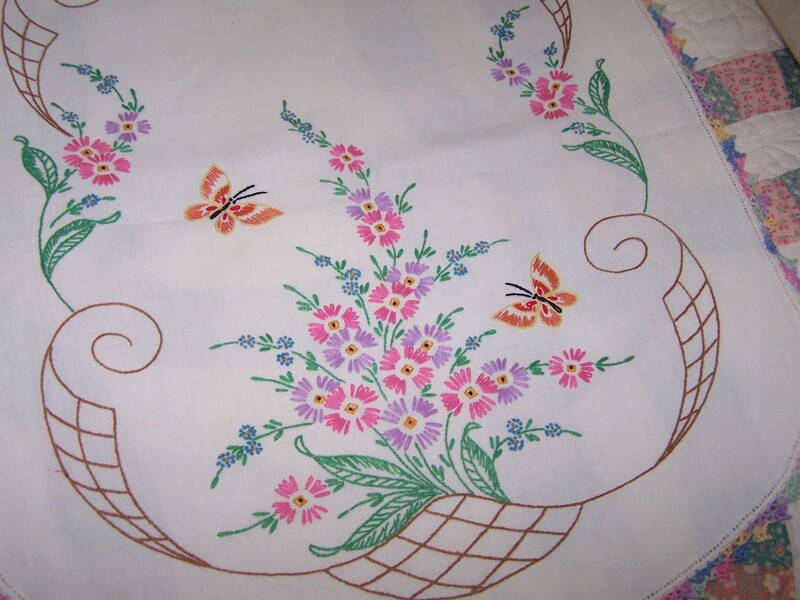 Vintage linens are lovely, but they’re much more meaningful if they’re family pieces. Lucky you to have some of these. The three piece set is for a vanity dresser, popular in the early 50’s. Linda, above, described it. There were usually 3 drawers on each side, with a narrow/skinny drawer under the ‘shelf’ for combs and brushes. A vanity bench usually accompanied, you could have your legs under the ‘shelf’, and you could sit in front of the mirror to brush your hair or put on your make-up. Beautiful work, Randi. How nice to give them to a family member who’d be sure to cherish these pieces. 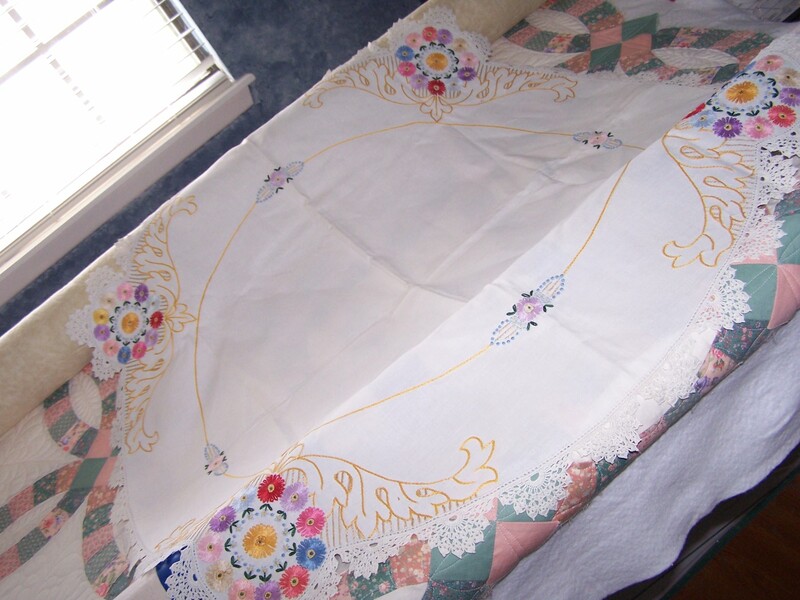 Will you make a sheet with names & dates on it to pass along with these heirlooms? 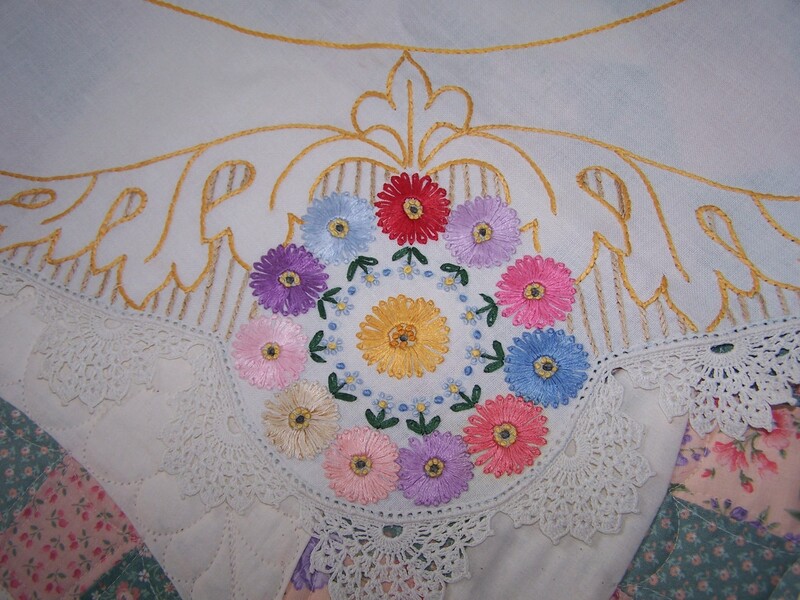 The embroidery is so perfectly done, but I especially love the beautiful variegated crocheted edging. You’re so blessed! 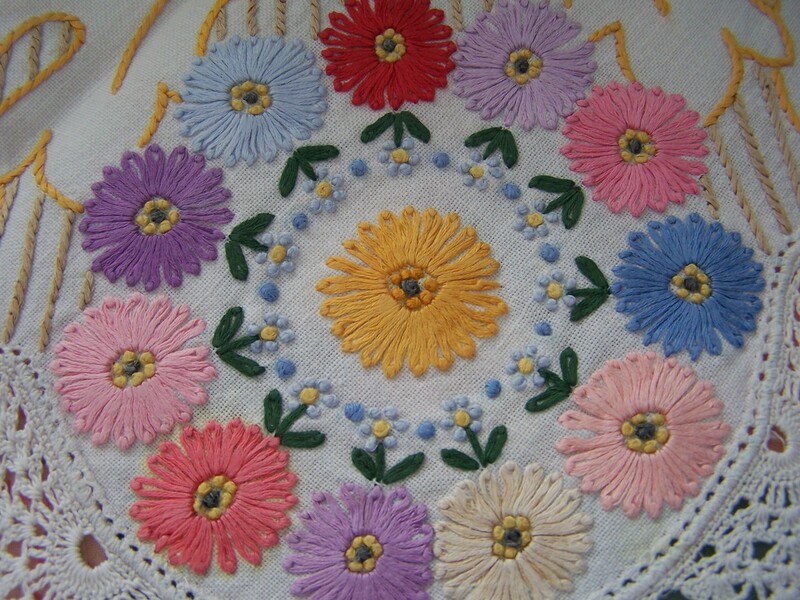 Lovely embroidery – thanks for sharing it. Although the three piece set looks similar to an antimacassar set (for putting over the backs of chairs and sofas to protect the furniture from Macassar hair oil), I think the vanity set is more likely to be what they are. 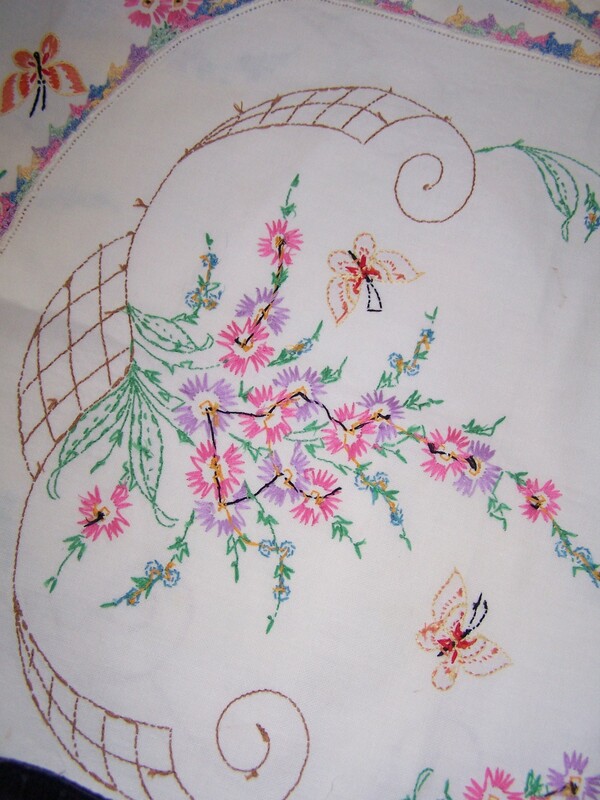 If they’d have been antimacassars, then the embroidered design would have been only stitched on the lower half of the fabric, as the upper half would have been draped over the back of the chair, and not seen. 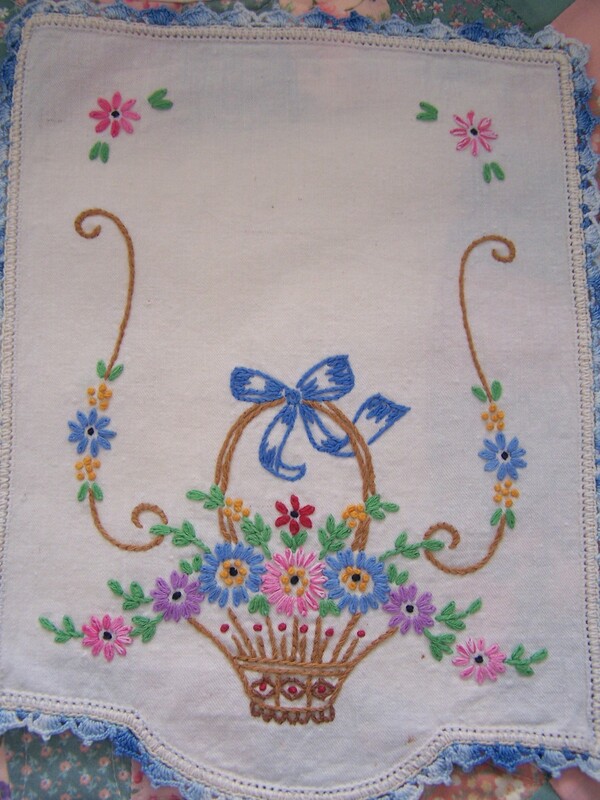 My grandmother used to still use antimacassars when I used to visit her (in the sixties) and they were beautiful but useless things, as they were forever falling off the furniture as soon as you leant against them! 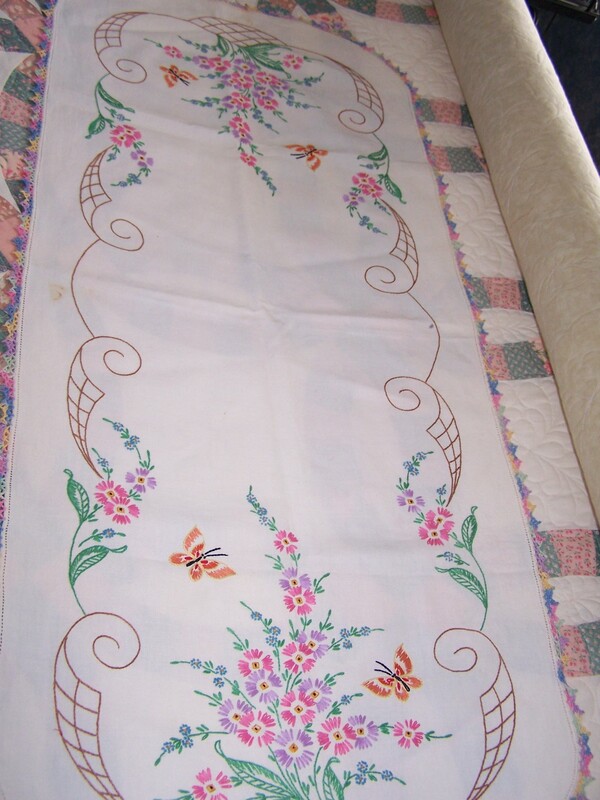 Donna is correct with the description of the three piece set but my grandma used to use them on grandpas chair so his greased hair did not “dirty” his chair and the smaller ones went on the arms for the same reason. She had made some for her vanity tht were for ladies and others for grandpas chair….so I guess you could say both descriptions are correct. I still have my grandmas vanity that used to sport her beauties. 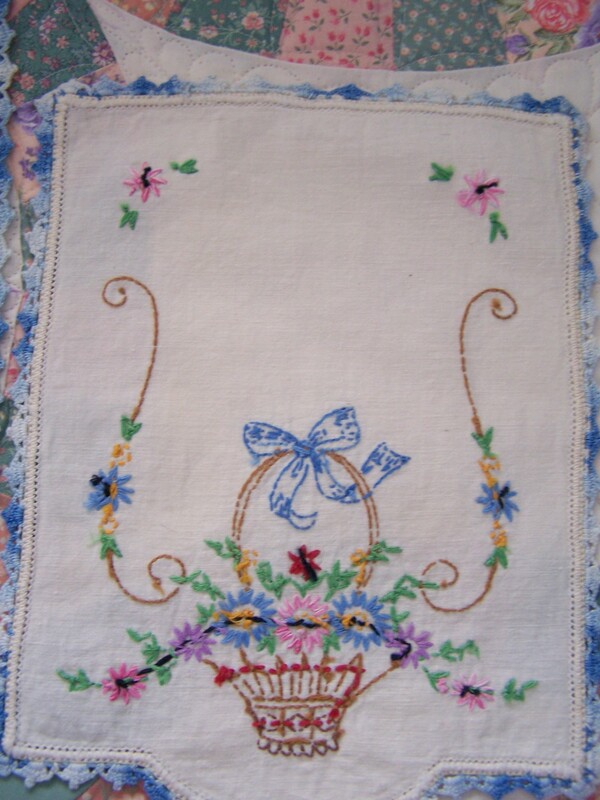 You are lucky to have some family heritage in your possession!!! Beautiful! I know you will treasure them!